Alaska: Researchers to pursue Alaskan octopus with divers, tags and pots - Researchers from NOAA's Alaska Fisheries Science Center are going to take a serious look at octopus starting in winter 2010. 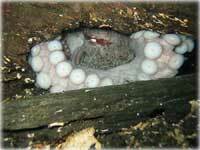 Giant Pacific Octopus glaring at the photographer from its den off of Sunset Drive north of Ketchikan. "Scientists haven't learned enough about octopus in Alaska to provide for an ecosystem approach to management," said Doug DeMaster, Director of the Alaska Fisheries Science Center. "The knowledge our researchers gain will be valuable on its own, but will be even more so if anyone wants to establish an octopus fishery here. We'd like to get ahead of that possibility with this North Pacific Research Board-funded project." "We've seen earlier investigations into commercial octopus fishing in Alaska and global markets for octopus are leading to increased interest in retention and sale over the past few years," DeMaster added. Octopus caught accidentally in groundfish fisheries in federal waters off Alaska may be sold, but there is no commercial octopus fishery in federal waters. In state waters (within 3 miles of the coastline), directed octopus fishing is allowed only with a special Commissioner's permit from Alaska Department of Fish and Game. "If we're going to be ready to manage Alaskan octopus as a commercial species, we need know a lot more about them, starting with their reproductive seasons," said lead researcher Elizabeth Conners of the Alaska Fisheries Science Center. The best guess now is that octopus in the Gulf of Alaska and the Bering Sea have distinct reproductive seasons, with mating in the late summer to early fall, spawning in the fall to winter months, and incubation throughout the winter and early spring. Researchers would like to find out whether octopus in Alaska have a seasonal migration pattern, as they do in northern Japan. Klawock: Partnerships Make A Difference By MARIANNE MILL - For over a decade, Senior Center Manager Roberta Foss dreamed of a new, larger senior center facility to serve elders in the Craig and Klawock area with a variety of services and activities. Roberta and her staff provide meals and transportation to elders and family caregiver support services out of the senior center facility owned by Tlingit and Haida Regional Housing Authority (THRHA). THRHA has graciously provided the space for a minimal charge to Southeast Senior Services (SESS) which has offered senior services to local elders since 1984. The facility also includes senior housing. 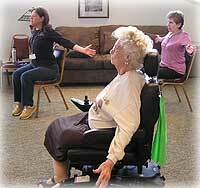 Sit & Be Fit Class at the Klawock Senior Center. When the time came to renovate the senior housing complex, THRHA succeeded in obtaining funding from the Rasmuson Foundation, Denali Commission, the Klawock Cooperative Association, Housing and Urban Development (HUD), and Alaska Housing Finance Corporation in order to triple the square footage of the senior center. The renovation increased the number of housing units and included accessible units for people with disabilities, a new open and spacious lobby, a reading/activity room, an exercise room, installation of an elevator, an expanded lunch room with a breathtaking view, a commercial kitchen, and offices for the senior center manager and a new service coordinator. While the building was being renovated, THRHA staff approached SESS to support a grant application to HUD to provide case management services to residents who are elderly or have disabilities. 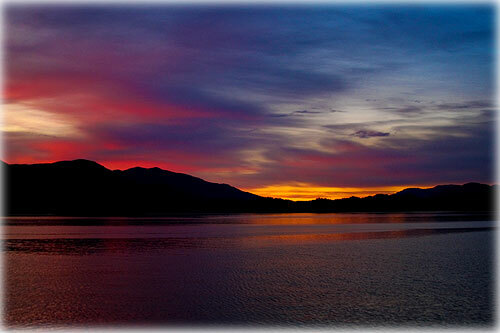 A third partner in the grant application was SEARHC (Southeast Alaska Regional Health Consortium), which agreed to offer health promotion opportunities as part of the project. The grant was awarded to THRHA and in September of 2008, THRHA contracted with SESS to provide case management/service coordination services. TOM PURCELL: Incivility's Origin - It's no wonder so many people are being less civil of late. I think it has to do with technology.